As a family, God is a part of our daily life. We pray to Him at meal time and other times throughout the day. We talk about His creation in our daily schooling. And we talk about His desires for our daily decisions. So, of course we know the Bible really well, right? Not necessarily. More on that in a minute. As you know, I have the opportunity to review things from time to time as a member of the TOS review crew. Well, the next company we have had the opportunity to review is called Real Life Press. 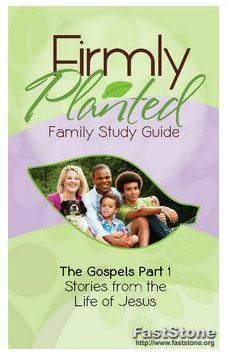 They sent our family a complimentary copy of their book, Firmly Planted, Gospels, Part 1, by Heidi St. John, in order for us to review it and tell you all about it. We received both the Family Study Guide and Student Workbook. This is a ten week study to help you and your family learn and understand the Bible. They are broken up into cleverly named sections. Each week begins with the full copy of the passage you will studying that week. Next is “Planting the Seed”. In this section, there are memorization options for ages 4-11. If you have older students, there are verses that are longer or more complex for them to learn. After you plant the seed, you have to “Water the Seedling”. In this part, there are 5-6 minutes story lessons. This story helps “The Seed” (big idea) germinate, or make more sense. Each day, there is a daily study for you to read to your children. It kind of breaks down the passage into smaller, easy to digest parts. Maybe a couple verses at a time. Or it will just dig deeper into the passage. Speaking of “Digging Deeper”, that is the name of the next section. If you have older students, this is where you can ‘dig deeper’ with them. You can have a more in depth discussion with them to help them (and you) understand the passage. The next section is called “Taste the Fruit”. This is where you will end your daily study. It encourages you and your kids to apply what you have learned from the study into your own life. The Student Workbook is a wonderful resource to accompany your daily studies. It has so many great activities that your kids would enjoy, like crossword puzzles, mazes, coloring pages and word searches. In addition to all of that, it has opportunities for copy work, journaling, and question and answer to determine comprehension. We began each week by reading the full passage. Then, we would read “The Seed”, “Planting the Seed”, and the “Additional Planting the Seed”, which was meant for older kids. Then we would read the “Water the Seedling” together. That was all on day one. I saw it as laying the groundwork for the week. On days 2-5, we would read the daily study, the “Digging Deeper” and the “Taste the Fruit” sections. Like I said above, the “Digging Deeper” opened up opportunities for discussion. I liked that. I got one or two “I didn’t realize that!” type comments from my kids. That was neat. I really like the “Taste the Fruit” as well, because it would give ideas on specific things to pray about. We would always end our daily studies with a family prayer regarding what we had read and how it applies to our life. Since I have kids from age 7 up to 13, we would always do the things geared towards the older kids as well as the younger kids. Sometimes that meant I was going over things that would go over the 7-year-olds head, but it was okay, because we had already gone over the information in a way she could understand. Usually, while I read, my youngest would be coloring from the student workbook. After our prayer, the kids would work on one or two pages from the student workbook. I especially liked seeing my eldest helping my youngest without me asking her to. I love those kinds of moments. I’m thankful for this study to help us bond together as a family and study God’s word. For whom? All families wishing to have a Bible study as part of their day! How much is it? The Family Study Guide is $9.95 for a pdf and the Student Workbook is $24. 95 for the pdf.